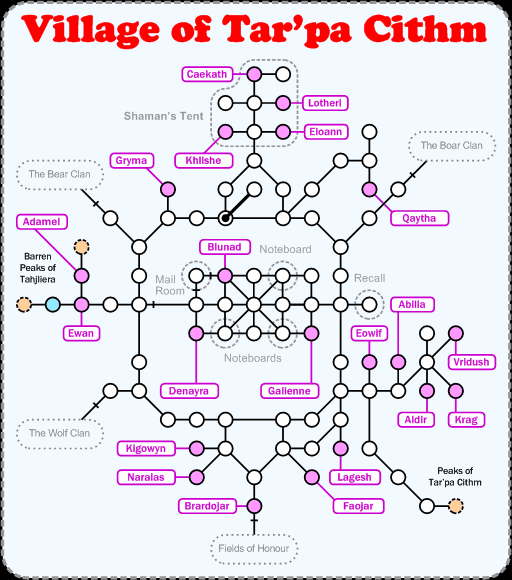 The Village of Tar'pa Cithm is the home city (for lack of a better term) of the barbarian class. Only barbarians can enter it and they spend a lot of time there. It's mostly noteboards and shops and other terribly useful things. Walk ( nw, 2w, 4n, e, look painting, open n, n, 28w, 3s, 3d, 5w, 2nw, 3w, 4sw, 3nw, 3w, sw, s, e ) to get from DH to the room marked in blue.